PRETTY LITTLE THINGS: The Daring Bakers Challenge February 2010 - TI-RA-MI-SU!!! The Daring Bakers Challenge February 2010 - TI-RA-MI-SU!!! - Zabaglione from scratch - definetely tasty. I used espresso to flavour it, but next time I'll surely try Marsala wine. 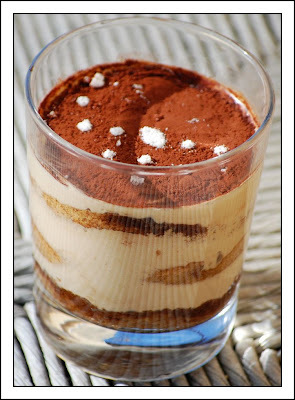 - Pastry cream, from scratch, obviously - nice, but for my taste too swett, and has got nothing to search inside a tiramisu. Sorry. 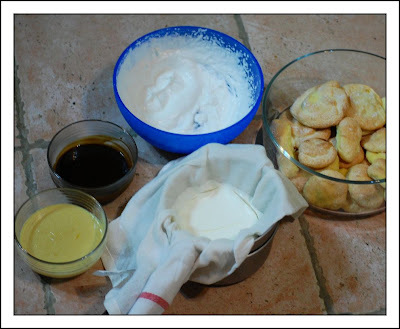 - Savoiardi from scratch - really good. Different from storebought in more than one way, I enjoyed the fact that I could made the shape just as I fancied. I planned on serving individual portions, so I piped the batter circle-shaped to fit the individual serving glasses. The result - following the recipes in detail I used all the required ingredients, including pastry cream and whipped cream. It was very good, but I think I'll scip both of them the nect time. And there will be a next time, for sure! It looks delicious! I liked being able to pipe the savoiardi in the shape of my ramekins too. I thought the pastry cream was a strange ingredient, but didn't realize there was no whipped cream in the real thing. I'll have to find a more authentic recipe and try again! I did love this version, though. How did it compare to Pompi's? Interesting that you think there shouldn't be cream and pastry cream in there - I did think it sounded odd - is it normally just mascarpone and zabaglione beaten together then? I love the serving in a glass, and am reaching for a virtual spoon, ready to dive right in. It's very invitng. well done with the challenge. BTW love your blog name. It reflects your style! It looks really good!Your site is amazing, such a wonderful recipe.If you won't mind, I'd really love to guide foodista readers to your site. Just add your choice of Foodista widget at the end of this blog post and you're all set. Thanks!